Life has been very busy this week. ML and I went to Georgia to visit with Stephanie and brought home this This is Rosalie she is an absolute sweetie and a great addition to the family. Everyone is loving her even Nina. On the knitting front I still am working on the same socks and I’ve started a prayer shawl. I am going to knitting in the morning with the intent to finish the Murky pair. 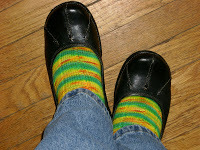 Today I purchased these fabulous shoes to show off my knitted socks! Aren’t they cute? Next Post Keeping up. or not!